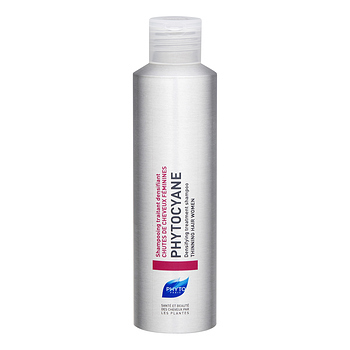 Phytocyane Revitalizing Shampoo works to restore hair's vitality through the synergistic action of its botanical active ingredients. It contains with Grapeseed Procyanidins and Ginkgo Biloba. It is highly recommended for temporary hair loss, PHYTOCYANE shampoo fortifies the hair (Cinchona bark decoction, Provitamin B5, Vitamin B6) and provides anti-aging action (Grapeseed Procyanidins and Ginkgo Biloba). Density and shine are restored to your hair. The ideal complement to the Phytocyane thinning hair treatment.